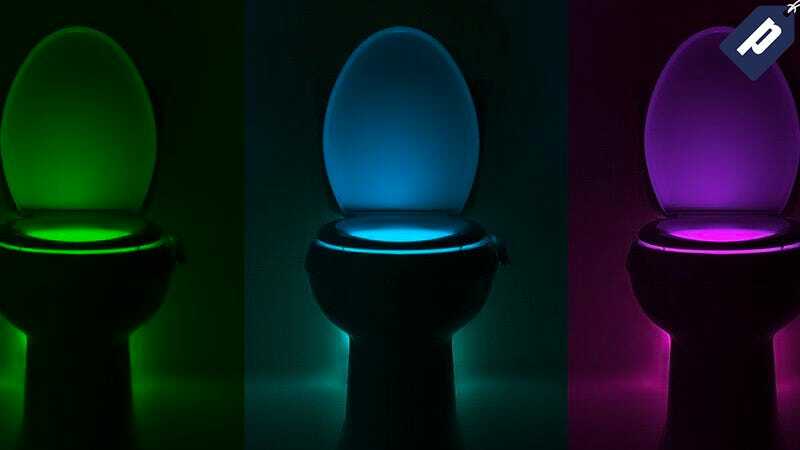 Meet IllumiBowl - the color changing, motion-activated LED toilet night light that’ll save you the stumbling and temporary blindness from those late night bathroom trips. This essential bathroom accessory normally costs $20, but Deadspin readers can get one for just $16.99 + free shipping. IllumiBowl has been making quite a splash since launching last year, raising over $95K on KickStarter and landing a pitch on Shark Tank. The concept is simple - snap IllumiBowl to the rim of your toilet and let it shine. It automatically turns on when someone walks into the bathroom, and illuminates your bowl in one of eight color possibilities. It’s super easy to clean, and only requires 3 AAA batteries to run. You won’t find a cheaper price online, and to make this deal even sweeter, we’re adding free, 10-14 day shipping to the continental US. Hit the link below to grab yours while supplies last. Citizen Goods curates unique and timeless modern goods and accessories for discerning tastemakers. So to be clear, this post is not editorial and we make money on sales..